Mr. Alfaro has a long standing career representing national and multinational corporations, lending institutions and banks and in the financing of large infrastructure projects, from gas and oil pipelines, electric utilities, steel mill plants, ferroalloys, ferrous and steel furnaces, real estate developments, export finance, hydro electrical projects, mining projects and road toll projects. Of particular importance is the fact that this experience represents twenty five years of legal practice in different economic and legal environments (inflation, hyperinflation, deflation, major devaluations, currency boards, etc.) in which risk allocation and protection, require legal, economic and political expertise. In this sense, Mr. Alfaro has accumulated an invaluable knowledge that contributes to its proficiency and capability in this area. These know-how and skills provides a value very much needed in the current local and global environment. Independent advisor and non-executive member of the board of multinational corporations (compliance, transparency and regulatory related issues). Extensive international experience in transactional work and negotiations bridging the differences in cultural and business patterns between parties to a transaction. Mr. Alfaro experience in international affairs is well recognized. He has been a member of the Advisory Board of the Council of the Americas, an institution founded by David Rockefeller. Its members are the main US corporations with investments in Latin America. 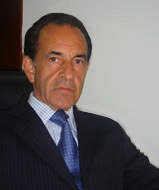 He is chairman of the Argentine-American Chamber of Commerce in New York, USA. He is also a member of the Executive Committee of the Section of International Law and Practice of the New York State Bar Association, Vice President of the American Foreign Law Association and active member of the International Bar Association. He has been particularly involved in project finance, telecommunication, airport privatization, aviation (regulatory issues, leasing and sale financing of aircraft, repossession, etc. ), securitization of assets and trade receivables, mergers and acquisitions, swaps and derivatives and international contracts. Mr. Alfaro's private practice expertise has been enhanced by his participation in major arbitration cases involving disputes arising out the construction of steel plants, furnaces, metals' exports, supply of machineries for oil exploration and contracts for export of oil products among European, American and Latin American companies or governments under the rules of the American Arbitration Association (AAA), UNCITRAL, ICC and others. He is member of the Advisory Board of the ITA, the Southwestern Legal Foundation and member of the panel of arbitrators of the AAA. Mr. Alfaro has written and lectured extensively on a variety of legal issues arising out of his public and private activities (see bio at (www.martindalehubbell.com). He has also been a professor of Administrative Law, specializing in government concessions and contracts at the State and Catholic University of Buenos Aires. He holds a Masters in Comparative Law of New York University and is licensed as foreign legal consultant by the State of New York. Privatizations, Government Contracts and Concessions. Cross-border and International Transactions. Compliance, Corporate Governance, Transparency and Regulatory Matters. Mergers and Acquisitions, Joint Ventures, Strategic Alliances, International Trade and Project Finance. Experience in Infrastructure Projects, Oil and Gas, Energy, Telecommunications, Industrial Projects and Real Estate Developments. 2004 - 2006 – Liaison Section of International Law of American Bar Association with International Section New York State Bar Association. Carnegie Council on Ethics and International Affairs, Fordham University School of Law, Wilshire Associates Inc., Euromoney, Institute for International Research, The Mining Journal, American Conference Institute, Financial Women's Association of New York, Forbes Magazine, American Conference Institute, United States Department of Commerce, Institute of the Americas and Colorado School of Mines, World Research Group and New York Law School, American Bar Association, Association of the Bar of the City of New York, New York State Bar Association, International Bar Association, Strategic Research Institute, Latin American Information Services, , Institute of Latin American Studies, Columbia University; The Council of the Americas, The International Bar Association Annual Meeting, The International Law and Practice Section Annual Meeting from the New York State Bar Association, The Center for American and International Law, British argentine chamber of commerce, Symposium on Global Markets organized by the Institute of Comparative Law, American Foreign Law Association. ENGLISH, SPANISH, understanding of French, Italian and Portuguese.